← I’ll Never Let Go, Film Photography. I’ll Never Let Go. In honor of one of my good friends who is finally coming back to DC today, here is a recipe for her favorite food (and mine): potatoes! This potato is the closest you can get to eating chips for dinner and not feel bad about it. I love these potatoes because they are so fun to eat; I peel it apart and eat one layer at a time, enjoying both the creamy inside and crunchy, crispy outside. 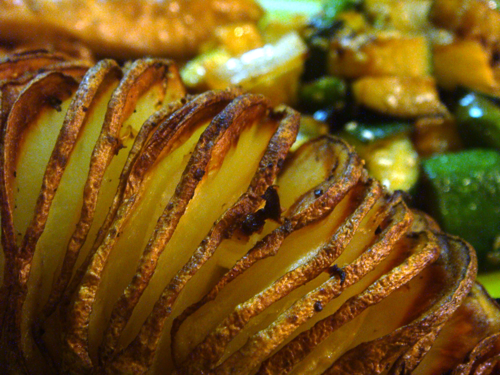 To make these potatoes, pre-heat your oven to 425ºF. Then, slice each potato into the thinnest layers you can without cutting all the way through, so the slices are held together. Don’t worry if you accidentally sever the potato because you can stick the sections back together and the oven does a good job of sealing it up again. But it’s easier to avoid the problem by cutting carefully to start with (not that I’ve been able to). Next, slice an onion as thinly as you can. 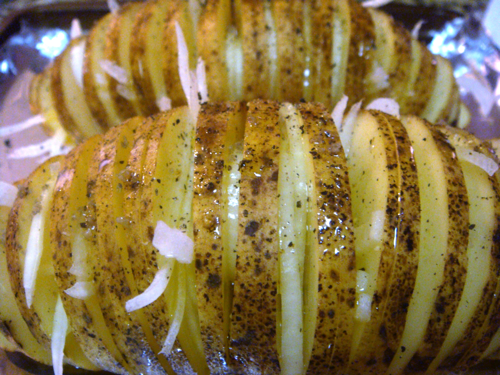 Now comes the best part- stick pieces of the onion in between the potato’s layers. You can add as much or as little onion as you want. 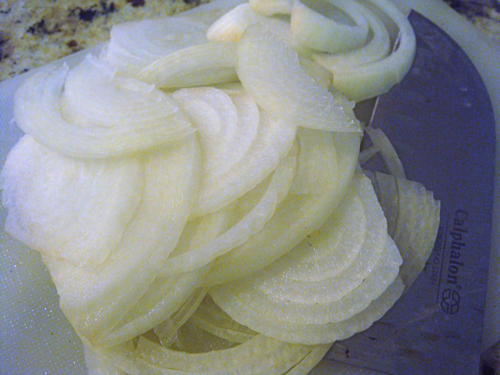 I like a lot of onion and put it between every other layer to speed the process along, but it still wasn’t enough! After your potatoes and onions get nice and cozy, drizzle them with olive oil and season with salt and pepper (or any other herbs of your choice). Put your potatoes in the oven and let them cook for about an hour and 15 minutes. These potatoes are definitely worth the wait! Don’t be surprised if your oven sounds like you’re making popcorn while the potatoes bake. Potatoes have a high water content, and the moisture that comes out of them pops on the hot oil. Your potatoes are done when the insides are easily pierced with a fork. You might also want to drizzle the potatoes with a little more olive oil halfway through the cooking process if they start looking dry. 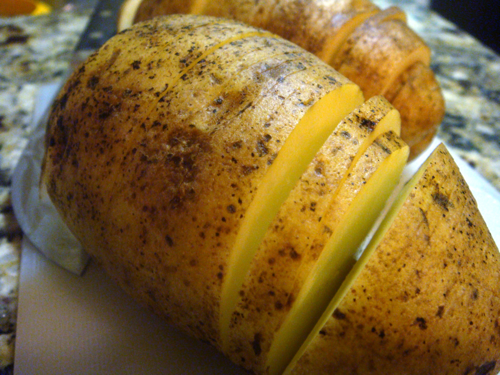 Crispy chip baked potatoes make a really fun side-dish for any meal, but I also love eating them on their own. Can you resist making them tonight? Let me know how they turn out! 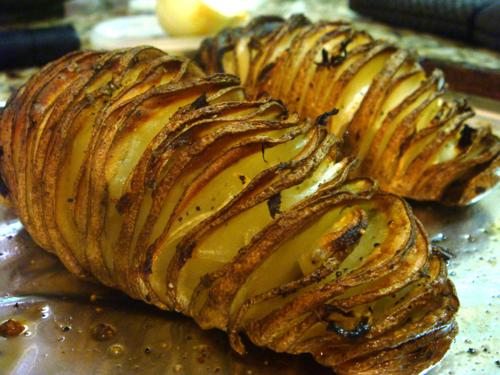 I referred to these sources while perfecting the taters: Smitten Kitchen and So Tasty, So Yummy. Looks amazing. I’m trying this tonight! garlic between each layer? hell-o. After making the mac n cheese that everyone loved, my roommate and I tried this recipe along with the balsamic glazed chicken and honestly it was the best dinner I have ever made! I have no skills in the kitchen but your blog always motivates me to at least try. 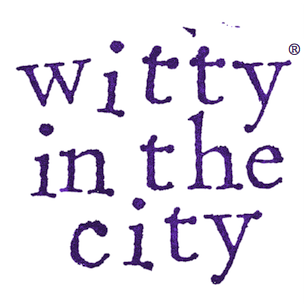 Huge hit! Actually had to make them again a few nights later for my family because I couldn’t stop bragging about how good it was. We added some shredded cheese on top. Delicious! We also added tomatoes and fresh mozz on top of the chicken. Thanks to you, everyone thinks I can cook! Tomatoes and mozzarella on the balsamic chicken sounds amazing. Now I can’t wait for summer and good tomatoes again!